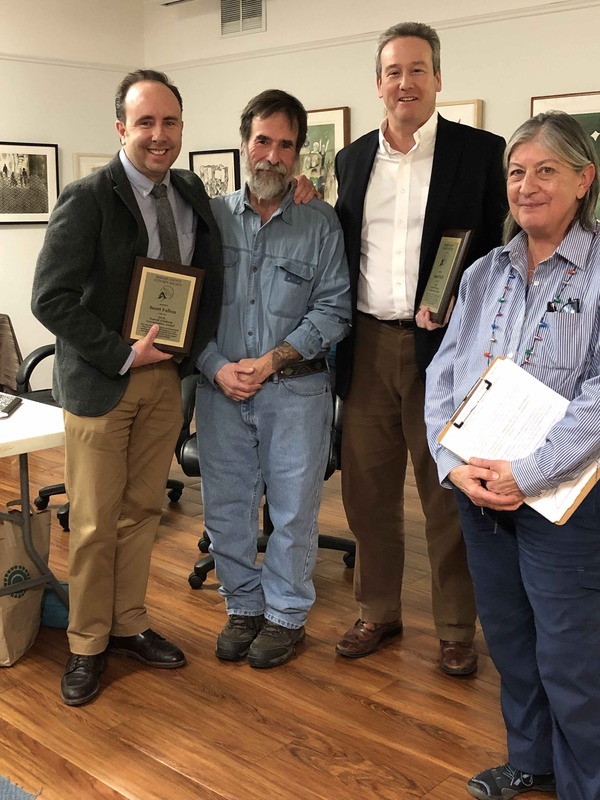 At its meeting last night the BCAS proudly awarded its 9th annual “Bergen County Audubon/Harold Feinberg Conservation Awards.” The recognition is bestowed upon those who heroes who have given of themselves with little recognition and often with personal sacrifice. Congratulations this year’s winners: Record environmental reportes Scott Fallon and Jim O’Neill; and author, educator and mentor Judy Cinquina. Conservation award is named in honor of the late Harold Feinberg, BCAS Board member and field trip chairman for many years. Harold was a mentor, an enthusiastic supporter of our endeavors and always gave freely of his expertise with a combination of patience and knowledge that few possess. For more on the winners keep reading! Jim O’Neill and Scott Fallon are the environmental investigative reporters for The Record. As journalists for the Record newspaper, Jim and Scott’s frequent writings have brought our most pressing conservation and environmental issues to the public through their thoughtful and wide-reaching articles. Scott and Jim have written on a wide range of environmental issues from our nesting Bald Eagles in Ridgefield Park to the dangers of the methane burner in the Meadowlands. They have covered issues such as Planting Milkweed-Save the Monarch, Rusty Blackbirds at Teaneck Creek, Destruction of Habitat for Solar Panels in Moonachie, Ravens in Fair Lawn and our Butterfly Festival. Their reporting has also brought to the forefront issues such as the dangers of toxic waste in Ringwood and Pompton Lakes and the perils of plastic in our environment. Their investigative and in-depth writing serves to educate and enlighten the public and brings positive change to the world around us. Now more than ever it is important to have journalists such as Jim O’Neill and Scott Fallon to bring our local environmental issues to the public’s attention. Bergen Audubon is very proud to present this year’s award to these two great reporters. Judy Cinquina is an avid birder, an author, educator and mentor. For 41 years Judy has been the chair and coordinator of the Mount Peter Hawk Watch in Warwick, N.Y. She conducted 20 years of breeding bird surveys at Skylands Botanical Garden, Ringwood, N.J.
Judy has authored articles published in the New York Times, Birding, Birder’s World, Bird Watcher’s Digest and NJ Audubon Magazine. In 1976, as a member of the Highlands Audubon Society, she authored “A Natural History of the Northern New Jersey Highlands.” Members of Fyke Nature Association look forward to Judy’s “Field and Feeder Notes” in the newsletter. Judy currently teaches Bird Watching in Midland Park Public Schools – Continuing Education. Judy’s teaching goes beyond basic bird identification. Field trips, (which she carefully surveys beforehand) bring a small group of students to various locations in New Jersey. She shares her knowledge of bird identification, mating and nesting habits, migration, and environmental challenges with enthusiasm and humor. 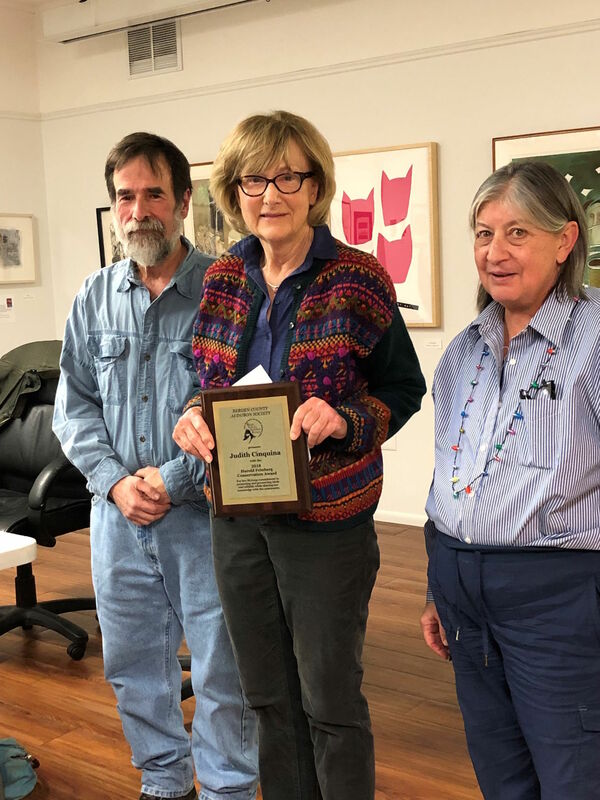 BCAS is proud to present our Conservation award this year to Judy Cinquina, who has given so much of herself to help our birds and educate people to love and respect them the same way she does.